Peterborough Phantoms hope they have snapped up a goalscoring wizard from Aus. The city club announced the capture of new import forward Wehebe Darge today (September 26). The Australian international is due to touch down in the UK today and will go straight into English Premier League battle this weekend assuming his international clearance is received in time. Darge is a 24 year-old who has been prolific for his home city club, Adelaide Adrenaline, in the Australian Ice Hockey League for several years. He also has ample experience in North America and sampled European hockey last season when racking up a half-century of points for Belgian side Chiefs Leuven. “I’m really excited to have the opportunity to come to the UK and join Phantoms,” said Darge. “I’m looking forward to learning from my team-mates and being challenged in the English Premier League. 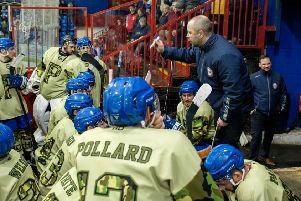 Phantoms coach Slava Koulikov admitted that a shortage of goals in the opening month of the new season convinced him to boost his attacking options. The city side have struck 16 times in six games to date. Only bottom two, Manchester and Bracknell, have hit fewer goals. “We feel it is the right time to add another import to our roster,” said Koulikov. “We have been aware of Wehebe for some time, we have received some very good references, and we have heard a lot of good things about him as both a player and a person. “I’ve seen some video clips of him in action and his ability to create and score goals is impressive. “He is very keen to prove himself in the UK and I’m more than happy to have him on board. Phantoms started the new season with four imports – netminder Janis Auzins and forwards Petr Stepanek, Darius Pliskauskas and Ales Padelek. But clubs in the EPL are permitted to use five overseas players now and Darge will fill the club’s quota. Koulikov confirmed no players will be released to accommodate the new capture.